o.k. most of you know how this one ends. Apparently someone leaked the results. 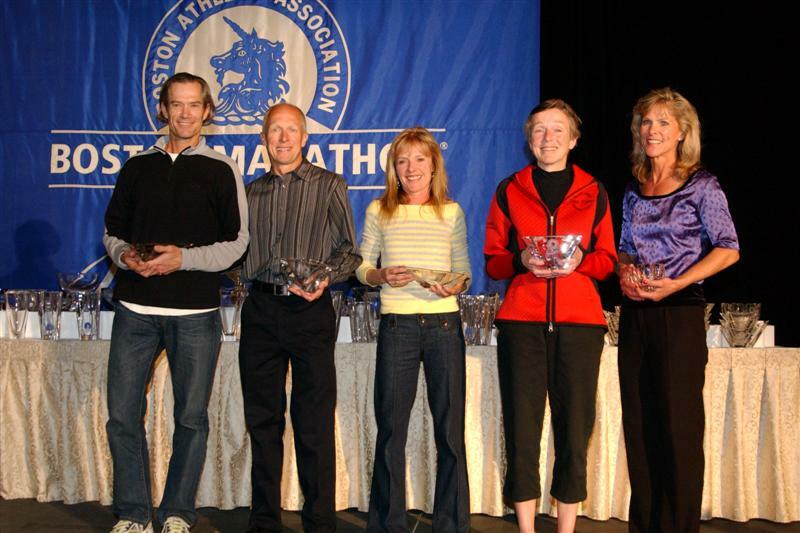 So since you know the ending maybe I should start with the moment… the moment I found out I won my age group division at the Boston Marathon. I was standing near the gear buses and finally put some warm clothes after spending 25 minutes waiting for running friends and working my way through the finishing chute. Those 25 minutes had been sublime with a real feeling of accomplishment and glow. I had run a fairly smart race, finished strong, met my goal of sub 2:44 and snagged a PR of over 3 minutes. I was in a great mood and didn’t want it to end. I felt the same way last year even though it had been a tougher race physically because of some painful and slower final miles. So I dug down in my gear bag and found the cell phone to call my crew chief who was watching the results from ‘training headquarters’ in California. I went to turn the phone on but it was already on and the batteries now were almost out. Crap .. but maybe I could manage one quick call. Nathalie picked up but the reception was bad. I could hear snippets of words .. “You ..did it! .. great job! … have ..a big head?” “Yeah .. it was a great day!”, I said .. “what do you mean ‘big head’? .. “It says you won!” …….what?!? .. really? It says that?? We continued to talk and I hold up my index finger to Tim who had started with me in corral 1 and we had shared those early easy miles. He looked puzzled .. was I asking him to wait a minute? Sure he would wait. I kept showing him the sign and then he got it .. #1 and his eyes got big and he had this huge grin. Then those annoying beeping noises telling me the phone battery is going to die. I promised to call back later after finding another phone. After being congratulated by Tim and a few other people I was in a bit of a daze and started walking through the family meeting area to head for the hotel. I was looking out for the South Park Twins but it kept playing over in my mind that I had apparently won my division at the Boston Marathon and the feeling was surreal. Colors seemed brighter and the combination of silver caped runners, volunteers, banners, balloons and booths made it seem like I was at some sort of carnival. The feeling wasn’t ‘jumping for joy’ but more of a sense of extreme accomplishment and gratitude that it had all come together. Plan the race, race the plan and the marathon gods had decided to give me my day. It doesn’t get better than that. Fade back to the start. Just minutes earlier I had high fived Brian Sell and Ryan Hall as they moved down to the left of the corral. Ryan was pumped .. he was jumping and yelling and looking like he did on the final mile of the Olympic Trials. Let’s get the party started! Things settled down for a while and I thought of what Butters had told me 10 minutes earlier. He wasn’t going to leave anything out on the course. It’s what I needed to hear and it clicked with me. I wasn’t going to leave anything out on the course either. My plan was to go out by feel for the early miles and see what kind of day it was going to be. I had a 2:44 pace band for splits and my Garmin with HRM to help keep me honest. I decided on a mantra of ‘kick the heels’ and mental image of lifting up my heels which I planned to use at any point that I felt I was slowing too much. The time approached 10:00 and we heard the pop of the gun. After about 10 seconds Tim and I cross the line and start the journey to downtown Boston. The early miles were somewhat cramped. People passing and difficult to get around some but not as bad as the corral 2 start last year. Tim and I checked our pace occasionally and tried to keep from going out too fast. It takes some real restraint as other runners pass you but we figured we would catch most of them later. The mile splits are from my Garmin are always a couple seconds faster pace than reality. The 5K splits are official though. We passed the first 5K mat and I thought of all the family and friends tracking me. I figured someone would figure out that Tim and I were running together. Not much to say about these early miles except it was nice to finally get underway. I decided to wear a beanie cap, thin wool gloves and a thin compression layer under my running shorts. Not a great fashion statement but after getting near hypothermia at TCM I decided to err on the side of warmth and I could always ditch the gloves and hat if need be if the wind and chill wasn’t a factor. The paces were on the fast side but my HR was telling me that I was just taking advantage of the gravity and I concentrated on running the downhills as light as possible. Somewhere around mile 5 I noticed that Tim was no longer on my shoulder. Bummer, but we all have to go with what feels right. The crowds by the Framingham Train station were big and loud. It was cool running this course again because this time everything seemed familiar. The little rollers, the towns and all the people. Seemed like more people were out than last year. I noticed my HR had moved up to and a little beyond my target of 158. I worked at making some subtle changes to breathing and pace to get it back down and save the energy. By mile 8, I started to feel some light soreness in my left hamstring, which got my attention. I tried not to let it worry me. But really what can you do but keep running and hope it doesn’t get worse. This stretch is so nice. No real crowds and easy to get into a good rhythm. I was wondering how many around me had a 2:39 goal and felt like asking but no one seemed to be in a talkative mood. The wind was not too bad in the first half. I’d tuck behind a group or another runner if I could or gap up to another group. It just didn’t feel that strong or consistent but I was glad to be wearing the extra gear and felt perfectly comfortable temperature wise. Wellesley was a total rush. First I stayed in the middle of the road but then swooped in for a short high five session. I blew some kisses to the girls holding ‘kiss me’ signs but unfortunately didn’t have time to stop. When it was all over I was running around 5:45 pace so eased up and let the adrenaline dissipate. After the half way point I started to feel that hamstring again and realized I needed to make sure to conserve some energy through the hills. I let off just a little and kept trying to get the HR in control. The first real hill of the course starts at mile 16 and it felt good to change gears slightly to motor up it. And it was good to know there was a mile recovery before the next. Actually feeling pretty good and in control. I had been carrying a 24oz bottle with electrolyte drink from the start and was looking for a friend to hand me another one along with a gel at mile 17. I started to get a bad feeling that they were not there so crossed over and grabbed an extra gel from a volunteer. Sure enough my crew missed the drop off but with the cooler weather I still had plenty of fluid left and could probably make it on just one bottle. The hills were a bit of a blur .. a noisy blur at that with the spectators out in full force but I felt like I was not losing too much ground nor exerting myself too much and my HR was actually edging lower. The wind was more of a head wind and the gust felt stronger. But it wasn’t nearly as bad as some of my training runs in the wind coming off the ocean. I just kept thinking of Mile 22 where the race was really going to start. The crowds were going nuts and before long I was up and over Heart Break feeling like I was in pretty good shape. Last year I experienced shooting pains in my quads on the downhill after Heart Break so this year I was relieved to feel like I could start to pour it on and get back to goal pace. I passed Boston College and said Hi to my dad (in memory) who went to school there for a brief time long ago. I started passing lots of runners since many of them looked like they were going through what I did last year. My ‘lift the heels’ imagery was helping. My feet were in good shape. A couple times the ball of my foot would feel hot or have a touch of numbness but I would scrunch the toes and that relieved it. The wind was becoming more of a factor but just leaned forward and added the coals to the fire when I could. I would surge for a bit and then start to slow but was able to then surge again. There were a few rough spots on the way down Brookline but I kept pouring it on when I could. I had started to visualize the final 3 miles of my MP training runs as I counted off the miles. It really helped me keep the focus on holding the pace and metering out the energy. Lift the heels, Lift the heels, Lift the heels. Somewhere around mile 24-25 I saw a ‘grey hair’ up ahead who could possibly be in my age group and he was struggling. I quickly passed him and it turned out that he was to become the 2nd place finisher. Near the Citgo sign my left calf started to cramp during a surge so I backed off slightly. That helped and soon was approaching the underpass. I ditched the bottle which still had a few ounces left and powered onto Hereford. It was so great to feel strong at this point of the race. On the turn onto Boylston I accelerated and kept the pace going. Just thinking that whatever extra effort I could muster here would just bring me in faster. The last stretch did not seem nearly as long as last year and by running around a 6:00 pace it didn’t last as long either. Other runners around me were pouring it on too and a group of us crossed at the same time. I congratulated a few runners around me. A guy named Murray (whose name I had heard being called out hundreds of times over the course) came up and thanked me for pulling him in on the final miles. At that point we were no longer competitors but had shared the course together and bonded by managing the marathon in an equal fashion. I hung around the finish area as long as possible waiting for people I knew to come in but then it was time to move on, get my clothes and give my wife that phone call. I had 3 marathons in ’08 with times in the 2:46 – 2:47 range and although I was being consistent, I really wanted to get myself to a new level. Maybe it was time to change up my training and try something new. Although I stayed with the basic Pfitz 70+ 12 week plan the long run paces got lowered to MP + 20-30 seconds and added a mid-week run with 10-12 miles MP. This part is officially called the ‘rbbmoose plan’ and watching Ray fly past me on mile 23 of the Boston Marathon last year helped prove that it had some merit. I also added Brad Hudson style hill sprints to most of my recovery days, ran lots of hilly trails and still fit in most of the Pfitz VO2max workouts. Some of the training weeks were pretty tough but I started to see results. Race Nutrition – One Gu Roctaine around mile 7, 3/4 bag of sport beans metered out from mile 15 – 16, a Powerbar Gu (supplied on course) that I ingested somewhere late in the Newton hills. About 20oz. of Vitalyte electrolyte drink. The South Park Twins, their parents and Joe– Incredible hosts, great guys and amazing athletes. Staying with the twins at their Cape Cod Training Center/Compound/Home was an ideal way to prep and relax for this race. To my crew chief Nathalie who has put up with the long hours of training, preparing great meals with tons of carbs, and is so totally supportive of my running. All my friends and family that followed along and have left messages of congratulations. It does mean a lot to me. All the RT and RW forum members that I had the pleasure to meet at Boston. It made Boston seem more like a small party than a faceless crowd. Tim, Dan, Pam, Chris, Bruce, Steve, David, Mike, Tijs, Adam, AR. I hope I didn’t forget anyone. I did go to Clerys Irish Bar with Tom around 3:00 but the line and wait was too long. The doorman would not let us in to even check if we knew anyone. Sorry but it was those Red Sox fans that messed that up. Ray .. the extra speed/stress on the mid-week MP runs and long runs made all the difference. Looking forward to breaking the 2:40 barrier with you some day soon. John Hill – Thanks for all the training advice and statistical support. The thread with you, Cindy and others tracking us was priceless to read the next day. Cape Cod Athletic club – post race shower, beers, snacks, great view of the finish and good company in the Lenox. Sweet. Boston Volunteers – just amazing … at every turn they were looking out for us. American Airlines – Thanks for letting the Boston Finishers jump up to priority boarding. What’s next? I’m going to enjoy running the trails this summer with probably no racing. Would like to gear up for some shorter races in early fall and figure out where the next marathon attempt will be.